Randolph professors work with students on an individual level. Randolph College’s faculty have once again been recognized as some of the best in the nation. 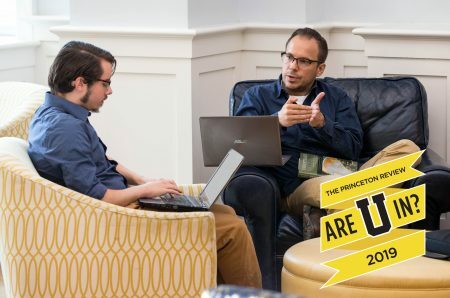 The Princeton Review ranked the College 18th for most accessible professors in the 2019 edition of its flagship college guide, The Best 384 Colleges. Randolph ranked 19th in the same category in the 2018 edition. In The Best 384 Colleges, The Princeton Review praised Randolph for its academic programs and individual student attention, and included quotes extensively from students surveyed for the book. “My academic experience has been challenging, there’s no doubt, but the professor support has made that challenge enjoyable and exciting,” one student said. Randolph was also credited for its vibrant campus life and highly active student organizations. Specifically mentioned were the College’s athletics events, campus-wide games like Humans vs. Zombies, the Even-Odd class rivalry, Skeller Sings, and off-campus outdoor activities like hiking, biking, and swimming. In addition, Randolph’s diverse student body was recognized. “Being such a small campus, it is hard not [to] develop lots of friends from several different social groups,” one student said. The Princeton Review tallied the rankings based on its surveys of 138,000 students (average 359 per campus) attending the 384 colleges in the book in 2017-18 and/or the previous two school years. The survey ( www.princetonreview.com/college-rankings/student-survey ) asks students 84 questions about their school’s academics, administration, student body, and themselves. The format uses a five-point Likert scale to convert qualitative student assessments into quantitative data for school-to-school comparisons. More information on the ranking methodology is at www.princetonreview.com/college-rankings/how-it-works. Read more about the 2019 edition of The Best 384 Colleges at https://www.princetonreview.com/press/best-384-colleges.